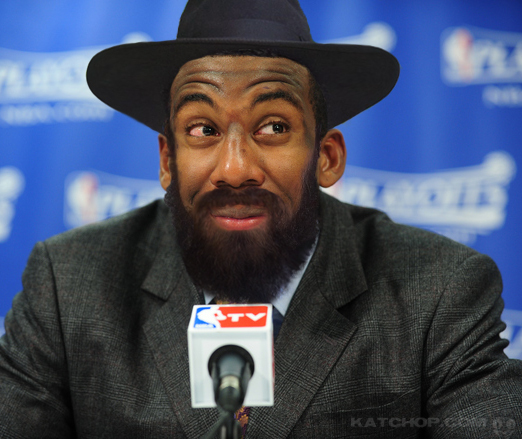 First there was Amare Stoudemire, the New York Knick who visited Israel this summer after learning he might be of Jewish heritage. The strength of Stoudemire’s Jewish connection is unclear; he says he is “a Hebrew through [his] mother,” but the exact nature of his lineage remains vague. Regardless, Stoudemire vacationed in Israel in July and August, telling the world through his Twitter page, “ze ha’halom sheli,” the Hebrew phrase for, “this is my dream,” and updating about his visits to Tel Aviv and the Dead Sea. He even got a tattoo of the Star of David –maybe his Jewish study hasn’t yet extended to the ban on body modification. And just a few weeks ago, LeBron James was photographed meeting–and holding hands–with Rabbi Yishayahu Yosef Pinto, a New York-based Kabbalistic rabbi known for consulting with business mavens on financial matters. Pinto, who speaks only Hebrew, met with James and business advisors in a private yacht off the coast of New York and is reported to have been paid at least $100,00 by the basketball star. No word on what, exactly, was discussed, but for that kind of money, here’s hoping James at least got the inside scoop on the best bagels in Miami, where Pinto also has a congregation. With all these basketball stars turning to people of the book, it was only a matter of time before bookies got in on the action. The team behind Bookmaker.com has come up with odds on the NBA star most likely to convert to Judaism before the year is over. Looks like the odds are good for Kobe Bryant, who did, after all, spend his teenage years in heavily-Jewish Lower Merion, Pennsylvania. Place your bets now, while Judaism is still vogue in the basketball world; before you know it, they’ll all have moved on to the next big thing.